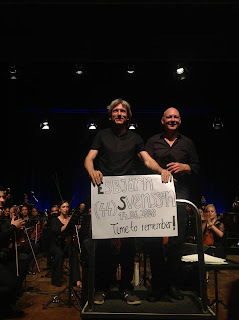 It's been more than five years that Swedish pianist Esbjörn Svensson of unforgettable E.S.T. passed away and left us all alone. This review is written just after the İstanbul concert of E.S.T. Symphony Project, which is based on orchestral arrangments made by Hans Ek including the drummer Magnus Öström and the bassist Dan Berglund from the trio. The world premiere of E.S.T. Symphony was made in Stockholm on June 10th. After the concert held in İstanbul on July 10th, the next concert will be at North Sea Jazz Festival in Rotterdam on July 13th. Even if the dates and places are not announced I have heard that there will be some other concerts. I should also mention that a similar orchestra project was accomplished in 2003 while Esbjörn was alive. In E.S.T. Symphony concerts, it is possible to see many different musicians from different countries in the line-up. We have listened to Jacky Terrasson and Michael Wollny on piano, Marius Neset on saxophone and Sarp Maden on guitar in İstanbul. Sarp Maden was the Turkish contribution to the project. Hans Ek, the arranger for the concert set list, directed the İstanbul Philharmonia Orchestra in İstanbul. Let me also remind you that the İstanbul concert was recorded and filmed for Mezzo TV. The excitement of the audience could easily be seen in their eyes just before the concert. This was not surprising because they would listen to the well-known compositions with many surprises. The first performance was Faiding Maid Preludium, which is also the entrance to the album Tuesday Wonderland(2006). We have heard the strings of the orchestra very well at the introduction and the orchestra's performance was generally fairly good. However the well performed bass tones, which are coming from the back, were powerless and the well played cymbals from the drum set were too bright. The arrangement was excellent but the sound was too crowded when the strings and cymbals were high. In the last part, the composition was transferred to Ajar from the album Leucocyte by means of percussion and violins. Sarp Maden and Michael Wollny has come to the stage for a great arrangement of the fabulous composition From Gagarin's Point of View, which has the same name with album that made the trio meet ACT label in 1999. It may be the most suitable composition to be harmonized. Except some new adds, it was a very similar arrangement with the original composition. When God Created the Coffee Break has invited pianist Jacky Terrasson and saxophone player Marius Neset to the stage. Even the piano of Jacky Terrasson has sounded a bit cold and dry to me at first, I can say that it was from time to time a bit more energetic compared to what we hear from Esbjörn in this composition. The woodwinds of the orchestra and solo of Jacky Terrasson have taken role after the tension is getting low when fast and strong touches of Magnus Öström ended and they were just perfect. Magnus was artistically very successful but I should say that the first three performances were acoustically not appropriate considering the sound of the drums. The contribution of Marius Neset to the partitions that was originally played by Dan Berglund in the album was huge and amazing. I think the best arrangement and performance of the night was Seven Days of Falling. Michael Wollny was on the piano this time. The first four notes from Dan Berglund for this very important composition of E.S.T. were enough to excite the audience. The main theme, which was played by the piano in the album, has been carried by the saxophone in this arrangement. Marius Neset, not only has done the work sufficiently, but also has performed a great solo in this part. The instants created when the double bass stayed with saxophone as a duo and when this duo is accompanied softly by the piano were incredible. Wonderland Suite can be seen as an individual piece of Hans Ek. Different than the others, Hans Ek composed a suite which includes many transitions and turn-backs consisting of Dolores in a Shoe Stand in the entrance and result, Goldhearted Miner and Goldwrap in the development. We have seen that the piano partitions are played again by the saxophone. The quintet including Sarp Maden, Marius Neset, Michael Wollny, Dan Berglund and Magnus Öström gave a very tensional and harmonious peformance. Sarp Maden's solo was especially impressive. The pastoral aura given by Esbjörn by putting papers in the piano, is given by flutes in Hans Ek's arrangement. The Goldwrap part was the most energetic part of the concert similar to old E.S.T. performances. The flanger-like effect and solo of Magnus Öström (who is giving the fundamental to E.S.T. for years) showed us why he is one of the best drummers in Europe. Wonderland Suite has been ended by the main theme of Dolores in a Shoe Stand carried by means of solo performances of Sarp Maden and Marius Neset. Serenade for Renegade's piano partitions were given to the guitarist Sarp Maden. The saturated and long tone of Sarp Maden was in a deep harmony with the original composition. We can easily say that Sarp has given a mystic and even oriental taste to the piece with the help of flutes. I should mention that Sarp Maden was very successful throughout the concert. It's been known by the listeners of E.S.T. that Dodge the Dodo of the live record from 1999 which is placed in E.S.T. Live '95 album is far better than the studio record in the album Gagarin's Point of View. More than that, I think it won't be wrong to say that live records of the trio was better than their studio-recorded performances until the world famous audio engineer Ake Linton has started to contribute also to the studio records from 2005. The album Live in Hamburg (2007) was a more famous album than the Viaticum contrary to the general belief. The entrance of this arrangement of Hans Ek, whose piano parts are again given to the guitar and saxophone, was very near to the album version. We have been carried to the old times by the deep heart-beat-like kicks of Magnus Öström which are well beneath energetic bass line and snare drums. The hard and cold touches of Michael Wollny to the piano and the performance of Sarp and Marius in the main theme were all fairly good. The bow performance of Dan Berglund and his authentic distortion tone has increased the tension of the music and the audience to a very high level. The arrangement made for my favorite composition Eight Hundred Streets By Feet from the album Tuesday Wonderland was soft and deep, similar to melancholic and naive original composition. One hand of the Esbjörn on the piano had been given to the saxophone and guitar. Hans Ek has also written a suite to Viaticum. There were Viaticum, 88 Days in My Veins and Unstable Table and Infamous Fable in Viaticum Suite. Viaticum means the last meal given to a man who is dying. For this reason, the composition is very dark. This feeling which is given by Dan Berglund in the album was given by brass instruments played from bass lines in the concert. The harmony between Michael Wollny and the double bass in 88 Days In My Veins and violoncello performances in Unstable Table and Infamous Fable were good. The trio behind has turned back to the main theme of Viaticum with short and sharp kicks of Magnus Öström in the end. The last performance was the incredible piece of E.S.T. from the album Strange Place for Snow called Behind The Yashmak. Sarp Maden, Jacky Terrasson and Marius Neset were the guests in this important tune of E.S.T. Marius Neset has given the main theme just after the entrance made by Dan Berglund. Similar to what has happened in the album, the musician who has pulled the trigger to start the improvisation and carried the energy to incredible levels was Magnus Öström. The reaction of the audience to this wonderful concert was a long standing ovation. They were applauding all musicians on the stage among which Magnus Öström and Dan Berglund were precious of the night. I am sure that Esbjörn Svensson was with them and us all night. There were people crying in front seats. Let me tell you that I have also cried a little bit. A young men has given a small banner board to Hans Ek on which a tribute word to Esbjörn was written. Just after that he has also given a red banner board on which the name of the people who has been killed during latest Taksim Gezi Park events in İstanbul is written. The level of the applause has been increased then. The board for Esbjörn was also given to the Dan and Magnus after the encore. It was Love is Real what has been played in the encore similar to many tribute concerts for Esbjörn. Korhan Futacı was on the stage for vocals. The lyrics of Love is Real has been written by Josh Haden, son of Charlie Haden, to the Believe Beleft and Below composition from Seven Days of Falling of Esbjörn Svennson Trio. Josh Haden's own vocal performance is in the same album's hidden track after the piece O.D.R.I.P. The vocal performance of this piece is a very difficult one and I think it is always Josh Haden who has performed the best for it. From beginning to end, I think, E.S.T. Symphony Concert was an unforgettable one for İstanbul audience. I have never seen a jazz concert that has been applauded this much fanatically. I should mention that the ones that could not join has missed an incredible concert. However, it is necessary to point out that the concert hall was changed due to low ticket sales as a result of latest events in İstanbul. Considering complicated sounds of the arrangements and big orchestra, there were many reflection problems in the small hall and the main important parts of the sound belonging to the solo instrumentalists at the back has lost its quality many times during the concert. It is also beneficial to point out that Ake Linton has recovered many problems successfully after the first couple of performances and I think this should be a lesson for our sound engineers in Turkey. As a last point, I should congratulate the success of Burkhard Hopper since he has organised this fabulous and difficult event including many musicians having different timetables.